Ikhwan Kim, "Confronting Agent Orange in South Korea," Foreign Policy in Focus, September 23, 2011. （2）“OKINAWA: Forgotten Island,” Time, November 28, 1949. （4）Steve Rabson, "'Secret' 1965 Memo Reveals Plans to Keep U.S. bases and Nuclear Weapons Options in Okinawa After Reversion," The Asia-Pacific Journal, February 1, 2010. 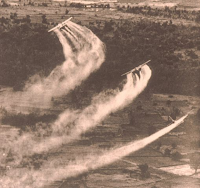 （5）William A. Buckingham, Operation Ranch Hand - The air force and herbicides in Southeast Asia, 1961-1971 (Washington D.C.: Office of Air Force History, 1982). （6）Jeanne Stellman et al. “The extent and patterns of usage of Agent Orange and other herbicides in Vietnam,” Nature, Vol 422, 681. （7）Philip Jones Griffiths, Agent Orange: ‘Collateral Damage in Viet Nam (London: Trolley Ltd., 2003), 169. （8）Fred A. Wilcox, Waiting For An Army To Die: The Tragedy of Agent Orange (Santa Ana: Seven Locks Press, 1989), 26. （10 ）"Employment of Riot Control Agents, Flame, Smoke, Antiplant Agents, and Personnel Detectors in Counterguerilla Operations,” Department of the Army Training Circular, April 1969. Sec. 20.1303 Rule 1303. Nonprecedential nature of Board decisions. （22）“Evidence for Agent Orange on Okinawa”, The Japan Times, April 12, 2011. （25）読谷軍用犬訓練所の周囲への枯葉剤噴霧の証言は、驚くべきことに、1990年の米軍用犬に関する報告書による。この調査は、米国内、ヴェトナム、沖縄で死亡した犬の睾丸の癌の比率を比較している。報告書では、ヴェトナムで死亡した犬は、米国内のそれと比べて睾丸への癌の発症率が1.8倍であったが、沖縄ではさらに高率の2.2倍だった。Howard M. Hayes et al., “Excess of Seminomas Observed in Vietnam Service U.S. Military Working Dogs”, Journal of the National Cancer Institute, Vol 82, Issue 12. （28）“Agent Orange Buried on Okinawa, Vet Says”, The Japan Times, August 13, 2011. （37）“Agent Orange Buried on Okinawa, Vet Says”, The Japan Times, August 13, 2011. （39）“Okinawan mayor urges probe into Agent Orange allegations”, Stars and Stripes, August 19, 2011.